You are here: Home / Colony Green / What’s My Colony Green Condo Worth in October 2017? This is a Colony Green Condominiums market activity report for October 2017. This report is comprised of statistical data extracted from October 1, through October 31, 2017 from our local Multiple Listing Service (“MLS”) as of November 1, 2017. This report may not include any “off market” sales. The Colony Green Community is typically very quiet and peaceful. The video below was taken from my kitchen window in the morning on October 31, 2017. The landscaping crew were onsite trimming hedges with chainsaws. I am interested in tracking the market in the community both as a real estate broker and resident home owner. 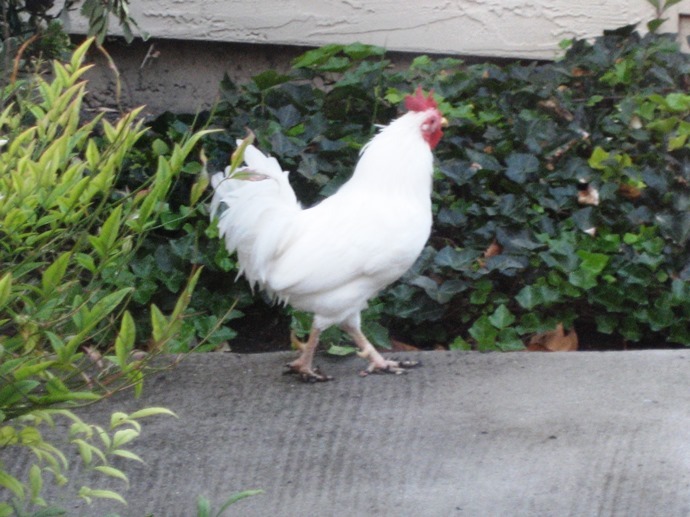 Ever since I became aware there is a feral rooster residing here, I also track Mr. Green Jeans the Colony Green Rooster. The photo below was taken on October 3, 2017 in the early morning. Someone has muddy feet! There was one closed sale in the Colony Green Community in October 2017. The condo listed on September 27, 2017: It was a “D Unit” which is an end unit. It has 2 master suites upstairs each with their own private bathroom and a half bath downstairs. It has 1,294 square feet of living space with an attached 2 car garage with direct access into the condo. It listed at $549,000. That was way below market comparable sales. On October 3, 2017 the condo was reported under contract, or sale pending. The sale was reported closed on October 27, 2017. Final sales price was $658,000. We need to keep in mind that the list price was below comparable market sales. Buyer had conventional financing. The Colony Green community is located in Blossom Valley in San Jose, CA. The community is across the street from Martial Cottle Park on the Chynoweth side of the park. It continues to be a desirable and still affordable place to live. If you miss out on the condos listed for sale in the Colony Green Condo community you may want to search other condos for sale in Blossom Valley. The market data for the Colony Green Condo Community, as well as the details of each individual sale, tell a story. Yet, the data does not tell the whole story. It is common for sales prices to vary depending on the size, location, and renovations completed, or not completed. I strongly believe marketing plays a huge role in the sales price as well. Quality photos are an important component to effective marketing. Keeping a home listed active for at least 7 days before accepting an offer means more people can see the home and likely spark multiple offers. This of course depends on market conditions relating to supply and demand. Colony Green Condos continue to be in high demand. Condo living is lifestyle living. Buyers are advised to make informed buying decisions by knowing the rules and restrictions of a condo association before deciding to buy a condo. Some associations are more restrictive than others. Knowing what homeowners can and cannot do is essential before deciding to purchase a condominium. If you are considering listing your Condo for sale, a word of caution regarding online Home Value requests. Best practice dictates that a local real estate professional visit your home, ask a lot of questions, and then provide a current market value. We do not use an Automated Valuation Model (“AVM”) of homes. Let’s chat. I’ll explain my documented approach to listing a home for sale and what I will do get your condo sold quickly and net you more money from the sale. It is also important that sellers understand their disclosure duties under Civil Code § 4525 and know why it is important to get an HOA Document Compliance Review. If you would like more detailed information about the Colony Green Condo community in Blossom Valley contact me at 408.972.1822. No one knows the Colony Green Condo Community better than Kathleen Daniels. That’s right. I am an original owner and I live here. PREVIOUS« What’s My Campbell CA Home Worth in October 2017?